If there was ever a match made in heaven it’s got to be banana and pumpkin. Regular readers will know of my banana obsession I try and put it in everything, I have almost an unhealthy obsession with banana! Love it!!! I will try it in any flavour combination, banana, Rum and coffee, banana and chocolate, banana and salted caramel, banana and blueberries and good old banana by itself. But this time I wanted to try it with pumpkin. 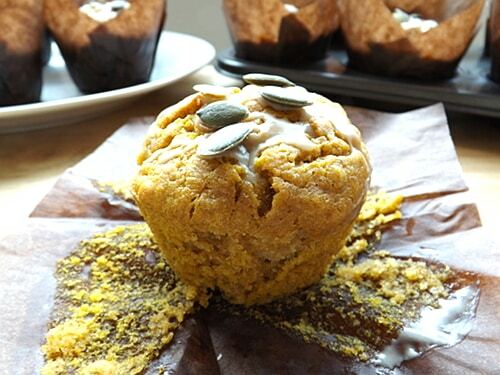 At first I thought this would be simple, just by adding some pumpkin to a tried and tested banana muffin would give me the results I wanted… Ummm, no it didn’t; the batter was sloppy, and it was far to wet to really bake all the way through. Having 2 wet ingredients was going to need a better balancing act than just adding one to the other. I had to lower my normal banana ratio to compensate for the added wet pumpkin. I also had to add a little more baking powder than normal to help with the rise, as this batter is quite wet. A touch of baking soda also helped in this area. I used quite a bit of spice in these to mask any baking powder and soda taste and also because they compliment pumpkin so well. 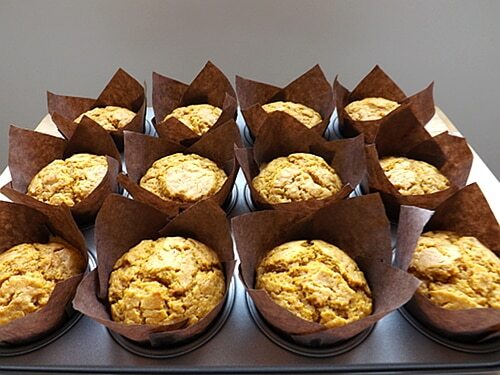 I also used the little trick of initially baking these at a far higher temperature for the first 5 – 7 minutes then lowering the oven back down to stop the muffins from burning and to make sure they cooked all the way through. And these little tweaks worked wonders. 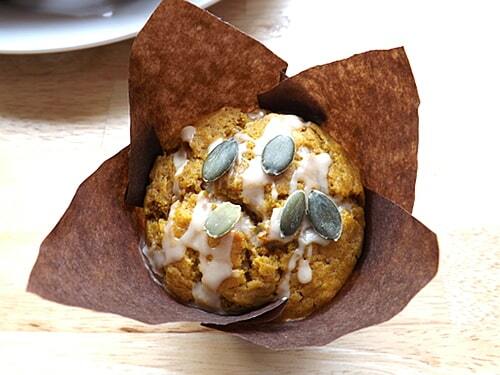 I got a high domed muffin full of banana and pumpkin flavour. I didn’t want to mask the flavours with any fancy toppings so I just gave them a light icing drizzle with a few pumpkin seeds on top, to give them a little crunch on top. 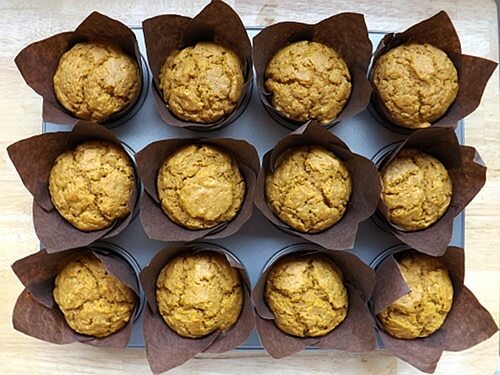 These will make a wonderful breakfast, I didn’t add to much sugar to them, as both banana and pumpkin are both sweet and I didn’t want a tooth achingly sweet muffin. You don’t have to just have them for breakfast, they also make wonderful mid morning snacks and great mid afternoon pick-me-ups. 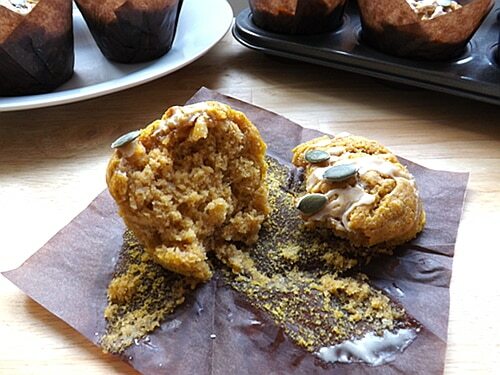 As to be expected with these ingredients these muffins are a lovely dense moist crumb, and so very moreish. I seriously couldn’t stop eating these. I had to force myself to keep some for the next 2 days to see how they lasted! This was a very difficult task indeed. On day 2 the banana and pumpkin flavour had matured and they tasted even stronger, and after a few seconds in the microwave (undercoated) they were scrumptious. Day three they were still really, really good they didn’t last any longer than that. I just couldn’t resist them any more. 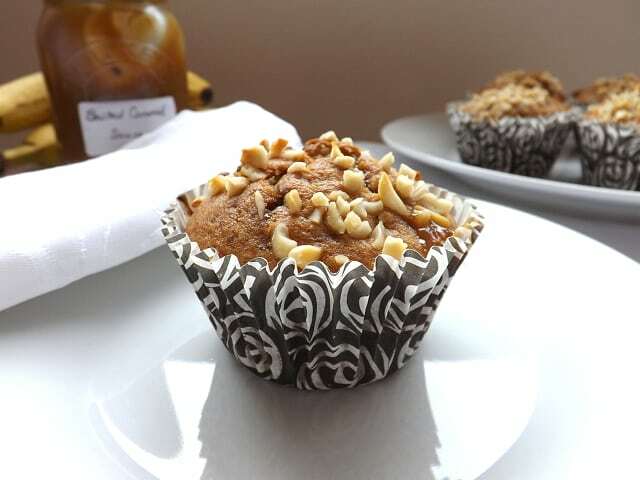 A lovely moist muffin naturally sweet from the banana and pumpkin and an undertone and sweet spices. Preheat your oven to 230C / 450F / Gas mark 8 and prep your muffin tins with liners or lightly grease them and place them to one side. 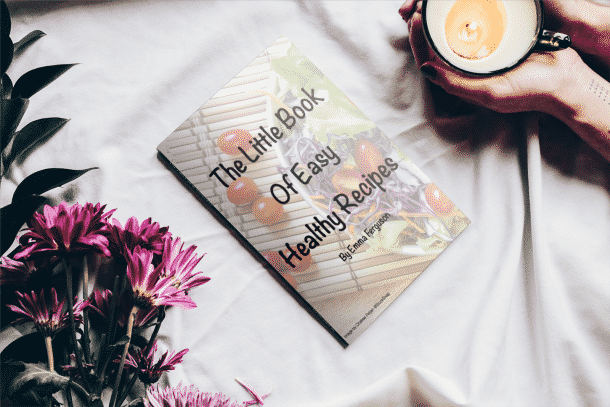 In a large mixing bowl using an electric hand whisk or in a stand mixer whisk the eggs, sugar, cooled melted butter and milk together till your mixture is light and well combined. Add in your vanilla extract, mashed banana and pumpkin puree and stir in until well incorporated. Add your flour, spices, baking powder and baking soda and gently mix until everything is just incorporated. 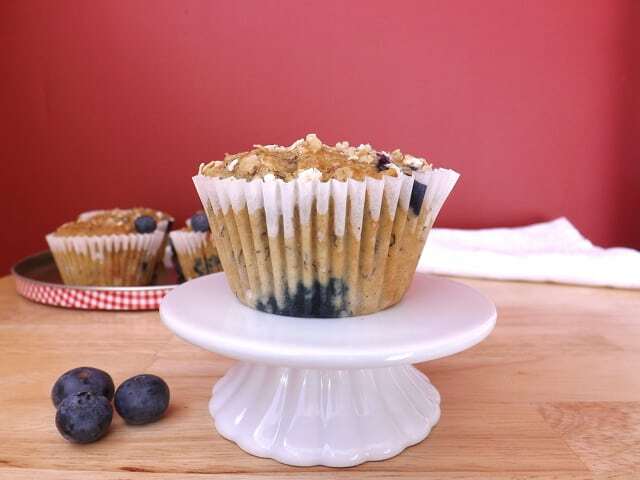 Don’t overwork your batter at this stage as it can cause your muffins to become tough. 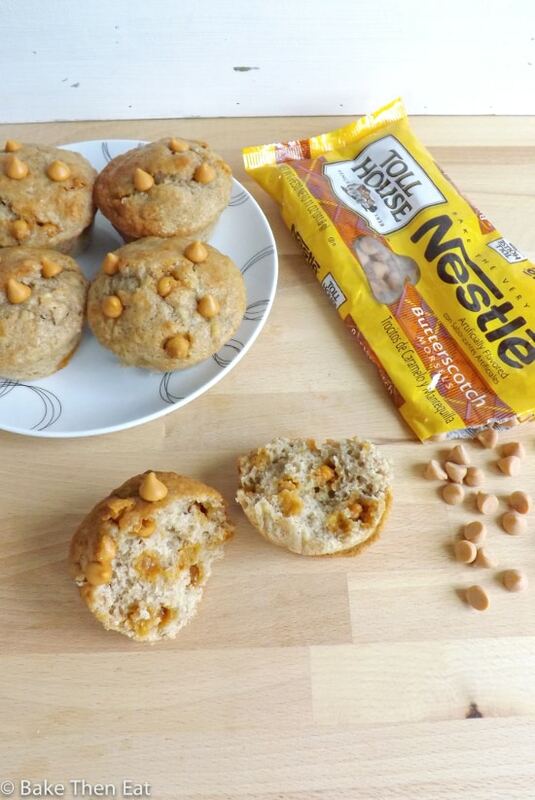 Fill each of your muffin cases up to the top; don’t be afraid to fill them, to get that high-rise dome you need to fill them! Pop the tins into your oven. But stay close by, as you will need to lower your oven temperature back down after 5-7 minutes. If you have a fast oven lower it after 5 minutes, if you have a slow oven like me lower it after 7 minutes to the new temperature of 190C / 375F / Gas mark 5 for a further 15 – 20 minutes. Keep checking once 20 minutes are up and they should spring back from a gentle touch and a tooth pick should come out clean. Once baked take them out of your oven and allow them to sit in their tins for 5 minutes. Then transfer them to a cooling rack and let them cool down. If you choose to add the icing drizzle, take your icing sugar in a small bowl and add the water and mix well. 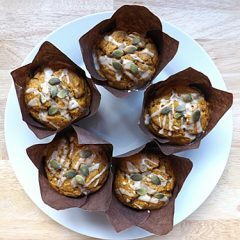 Using the back of a teaspoon drizzle the icing over your muffins and add at least 5 pumpkin seeds to the top of each muffin. Serve and enjoy. These are ABSOLUTELY divine. Just made them and my son is asking for more. Little does he know about the hidden goodness. A must in my household. 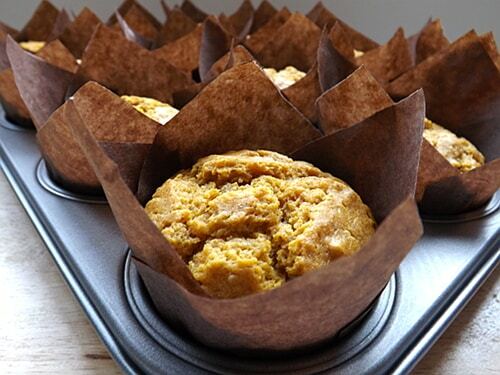 Thank you, the combination of banana and pumpkin made them sweet and moist. Banana muffin, I am gonna try them this holiday season. I hope you do, I am sure you will love them. 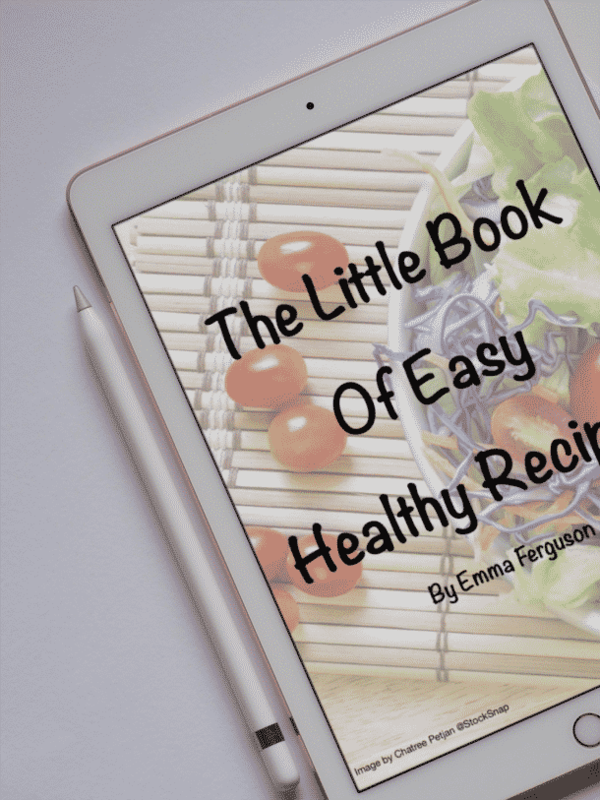 Gosh, I’m loving his recipe! Looks like I see pumpkin and banana muffins in my near future! Hi Tamara thank you 🙂 you’ll love them when you try them they are lovely. I have a somewhat stupid question, but I am new to baking. 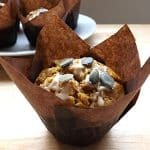 What is the name of the brown wrapper material that you put the muffins in, and how do you manage to fold it in that way, so that it creates the appearance of petals? You are speaking my kind of language with these. Hi Bintu, thank you. I think this has now become one of my favourite combinations and will definitely be making these again. 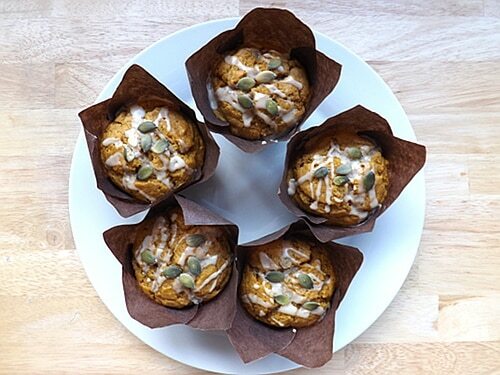 Wishing that these were on my breakfast table tomorrow morning! If I get some time this afternoon, I’m baking these! 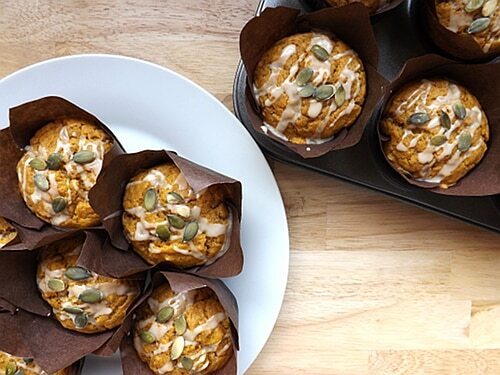 I’m not a huge fan of pumpkin but these do look lovely and I am very tempted to give them a go. I appreciate the ingredients in cups as well, as I am not so good with metric weight. Hi Kelly, thank you. They did taste really good it was a bit of a balancing act to get the pumpkin and banana ratio correct but it was worth the trial and error.